Offers farmers an environmentally friendly alternative to the use of chemical herbicides. Are you looking for a solution to the problems associated with chemical weed control ? Have you had enough of the risks to posed to human health, the health of your farm and the adverse implications for the surrounding environment ? With saturated steam weeding technology you can minimise or eliminate the need to continually buy more herbicides to control your weeds. 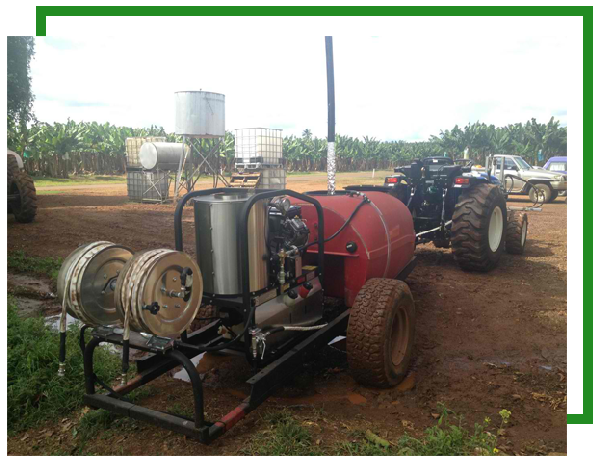 We are able to provide you with the latest leading-edge technology steam weeding units with spray attachments to suit your farming needs. We provide complete training to ensure you get the optimum results from the machine.